We’ve been reading Rump by Liesel Shurtliff in my 2nd grade class, and we’ve just gotten to Chapter 12. We’ve finished about a quarter of the book. One of my students commented that “the story really feels like it’s starting to take off” and many her peers agreed. I hadn’t planned on having a discussion about fiction story structure today, but I took advantage of the teachable moment and pushed back our next subject for a few minutes to go deeper into story structure. First, I asked the students what she meant by her comment. This led her to say that the character was in trouble and that things were starting to happen to him, and she wanted to know what would happen next. I agreed with her, and led the discussion into that a bit more, including more specific academic vocabulary like problem, solution, and characters in our talk. Next, I pulled up this video on Youtube and we watched it together, pausing at a few points to connect our discussion of Rump to what was shown in the video. I just adore this video about Plot Mountain from Scratch Garden, because it describes fiction story structure in a concise and fun way. It also features fairy tale elements, so I knew it would connect well with Rump. I paused after the video talked about the Introduction, and I explained that what we’d read so far in the story was called the Introduction. We’ve gotten to know the characters and their histories/pasts, and we know enough details to feel like we’re in the setting. The problem has been introduced. The next part of the video talks about rising action. After watching that clip, I tied the term “rising action” into what my student said that began our discussion (the story starting to take off). The image of the diagonal line mountain rising made sense to the kids, and they started to get even more excited about what would happen next. Then I showed the remainder of the video where they sing about the hero’s journey, the climax, and the resolution. In my own house with my 5 and 8 year old sons, we’re always noticing that movies and shows seem to all have “a big battle” at the end (Living with all boys—-this is what is watched at my house). But my boys have a point-most stories DO have that big battle, whether it’s a huge Marvel or Power Rangers one or just a fight between the characters or a party scene at the end. I talked about that with the class, and they shared the “big battles” from their favorite movies and other books. We labeled those big battles as fiction story climaxes, and this vocabulary term will be referenced often through the year. Then I asked the class if their movies were over the second the battle ended, and they all said “No!” One student said that there is usually a few minutes extra at the end. We looked back at the video and saw that this is called the “Resolution”. The entire discussion with video time took about 12 minutes, but even in that short time, our class had an anchor lesson that will hold much of our fiction learning for the rest of the year. We’ll revisit the Plot Mountain video clip again and again, and we’ll talk about it when we read aloud other books. I’ll bring it up in writing conferences as the students develop their narratives and in book chats about their independent reading. As a veteran 17 year teacher, I’ve realized that you’ve got to take advantage of these rich teachable moments that arise unexpectedly. I was fully present while reading the chapter book, and I truly listened to my student’s comment that sparked the entire tangent. BUT… I know that story structure doesn’t show up until later in the district curriculum map, and we were also late beginning our social studies lesson. This wasn’t a model picture perfect 3-part lesson plan, HOWEVER…it was such a rich learning experience for our class—-one that will grown in value each time we revisit the discussion, going deeper and deeper each time. I could have ignored the student. Or I could have said, “You’re right. The story is getting good, and I’ll share more about story structure when we get to Unit 4.” But I made a judgement call as the teacher. I wanted the students to see the video right then and learn it when it was applicable. It would be like saving a relevant (Oh this reminds me of) anecdote for the NEXT time you see a friend rather that just saying it right then and there at your coffee date. The students were ready to learn about fiction today, and I wanted to capitalize on that interest. I believe class community is built and strengthened in moments like the one I shared with my class today. 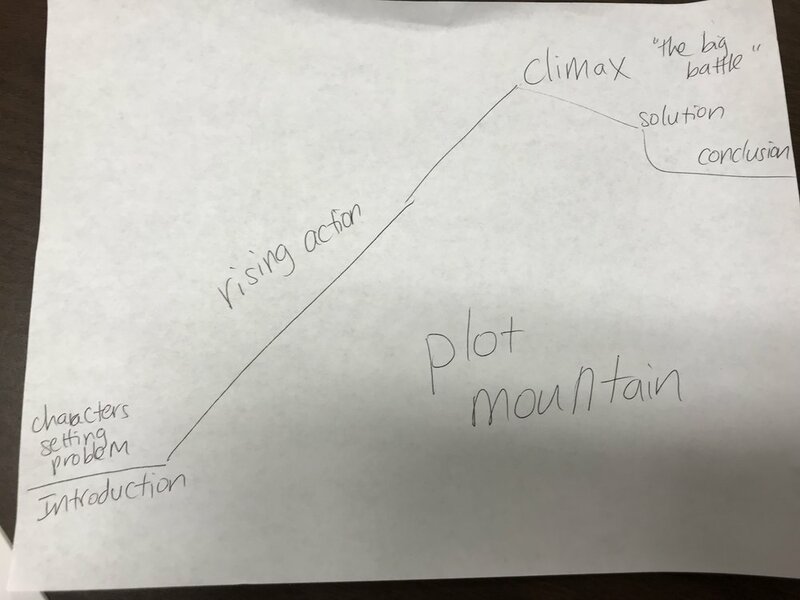 For the rest of the year, I can say “Plot Mountain” and immediately activate the students’ knowledge of story structure. The class was focused and engaged in the discussion, and I was present with them, not really worried about the next item on the day’s agenda. This started out as a blog post about story structure but ended up being about a lot more. Do you still have teachable moments with your class? Or do you feel tied to the framework of your day? Do you feel pressure to be Teacher Observation worthy all day long? Or do you give yourself permission to have spontaneous learning experiences if/when they arise? If I had happened to be observed right then, how do you think I would have been evaluated? The activity was nowhere on my plans-I was off schedule. There was no differentiation at that moment. But the kids were engaged, focused, and learning. And it set the stage for future instruction. So where do teachable moments fit in this uber accountable world of education we live in?